For some unlucky users (including us), there’s been recurring problems with the sound vanishing from Windows and Windows 7 machines when they’re woken up from hibernation. All our computers run 64 bit versions of Windows, but we understand that users on 32-bit Windows have suffered the same annoying glitch. Our problem seemed to be down to the onboard Realtek soundcard which refused to wake up when Windows woke up – which was particularly annoying seeing as we love to blast the office with big tunes through our juicy pair of AudioEngine speakers. We’d already spent some time rummaging around Microsoft’s site, and got nowhere with their Troubleshooting Sound Issues page or their ‘No Sound In Windows‘ automated ‘diagnose and repair’ page. * In the Troubleshoot computer problems window, click a specific task to automatically diagnose and fix a problem. To view more troubleshooters, click a category. It didn’t work for us, but it may sort out your problems, so please try them first. 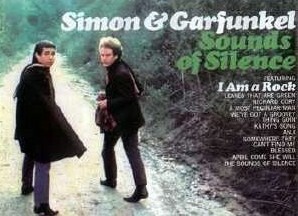 Fed up with the sound of silence, we tried downloading the latest drivers, uninstalling, reinstalling, rebooting and doing a little jig around the PC in an attempt to please the Gods of the Soundcard, but still the problem persisted. In the end, we figured out a bodge that works for us every time, so we thought we’d share it with you (note: we’re using screengrabs from Windows7, but it’s more or less the same for Vista). We hope it works for you too, because it was driving us mad. Right click on the speaker icon in your desktop taskbar. Select ‘sounds’ to open up the dialogue box we’ll be tinkering about it. 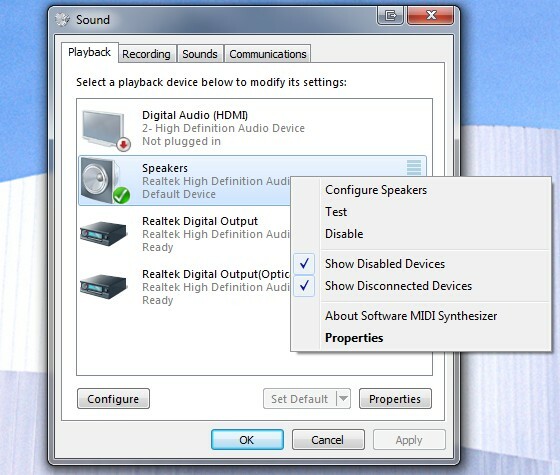 The dialogue box has four tabs running along the top – select the ‘Playback’ tab. Next, right click on the icon that shows your speakers (the one with the green tick) and you’ll see a pop out menu. Then right click again and enable the speakers – and that should be it – sweet sweet music should be flowing forth from your PC. We started getting another strange problem when YouTube videos starting playing at half speed. We noticed that this only happened when the sound wasn’t working, so fixing the sound (as above) sorted the problem. It seemed that the Flash YouTube video was trying to sync itself to the soundtrack which, of course, wasn’t forthcoming, hence the ultra-slow playback. Of course, there’s a host of other reasons why videos may be playing back slower than a slug on ketamine mad these may include a slow connection and a outdated/incorrect drivers. Wow. you guys are incredible. You know how many times I’ve had to restart my computer because I had no more audio and video couldn’t be played back on websites? This is awesome article and it worked for me instantly as soon as I disabled / Enabled the speakers. The video playback worked as well. Glad it worked for you as well. It drove us crazy until we finally worked out the fix! You are genius. I have been trying as you to do lots of different configurations, drivers etc. Just by disable and enable it again worked like magic. I had a great sound pack with beach type sounds such as seagulls, droplets, etc. For some reason it has “disappeared” from my desktop (Running Win7 on a corporate computer at work) … I tried restoring it but as I mentioned, it has disappeared from the choices in control panel … Personalization. I also notice when I choose a group screensavers to rotate every 5 mins when I restart each morning they get stuck on one and I have to go back into CP and re-choose by “select all” and opt for 5 minutes intervals. What is not happening to cause these problems , and more important, how do I get the seagulls back into sounds? When I tried this fix I literally have nothing listed in my playback tab area no speakers no nothing lol, can you help me from here please? 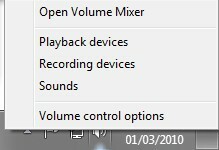 i m using win 7 . the problem is that when i plugged headphone then cross sign on volume not comes but when i not plugged headphone a cross sign comes on the volume icon below . Any solution ? I tried that but when I went back in to check that it was disable it told me it was still enabled. Messed around with that tried making sure I was administrator and all. Oddly enough my game Rome total war had a error and wouldn’t start at the same time. Any ideas?